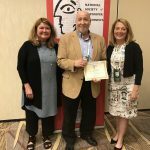 For the second year in a row, Sleeping between Giants has been awarded 1st Place Humor Blog by the heavily medicated judges at the National Society of Newspaper Columnists conference in Cincinnati. 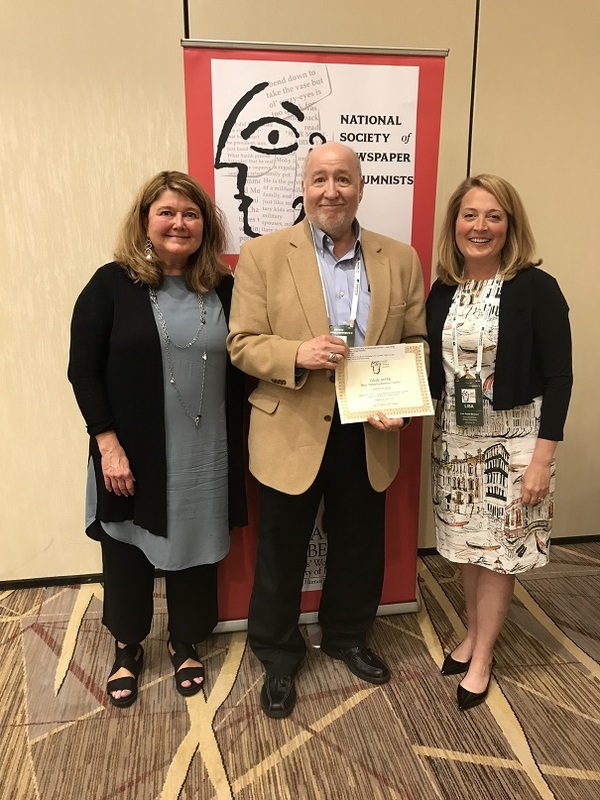 Dave flanked by Pulitzer Prize and 2018 Ernie Pyle Lifetime Achievement Award winner Connie Schultz and NSNC President and national award-winning columnist Lisa Smith Molinari. Both are prepared to call security, if necessary. Humorist, writer, former Chicago reporter, Dave has written for online media, print, television, and radio. Creative, clever, witty – these are traits that kept Dave in detention for most of the eighth grade. But as an adult these skills led to award-winning columns, TV and radio commentary, numerous magazine articles and essays, a local Emmy nomination for a television documentary, and even sketches for Bozo the Clown and as a contributing editor for National Lampoon Magazine. He was selected Humor Writer of the Month by the Erma Bombeck Writers’ Workshop. His columns also appear on HuffPost and on HumorOutcasts. 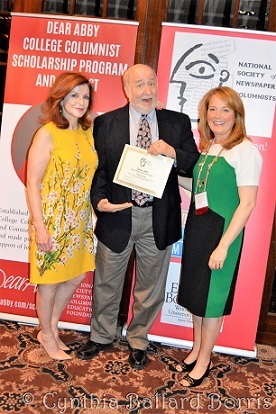 Dave has twice been awarded Peter A. Lisagor awards for humor columns and commentary by the Chicago Headline Club, received the Parenting Publications of America Gold Award for Humor, and a 1st place in the HumorPress.com Humor Writing Contest. 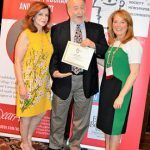 Making a fool of myself in front of famed New York Times columnist Maureen Dowd and NSNC President Lisa Smith Molinari at the NSNC 2017 conference. Very professional, Dave. Very professional. 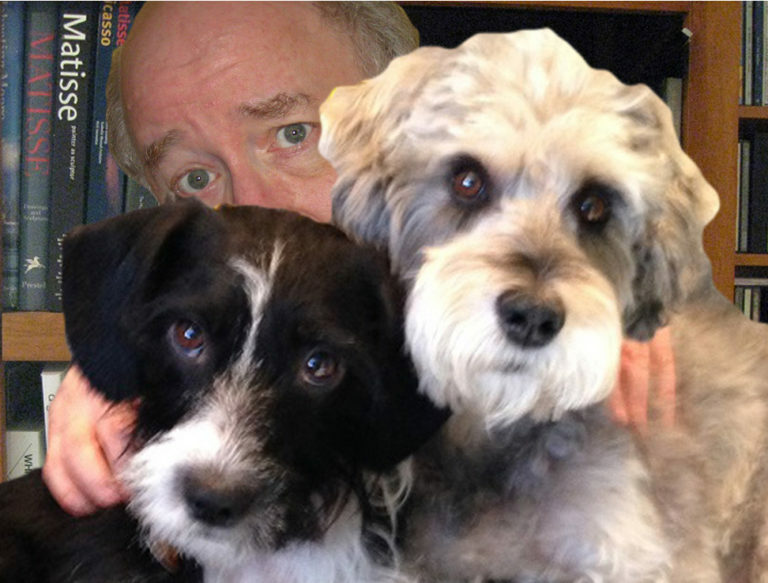 Sleeping Between Giants grew out of Dave’s affinity for dogs. Like them, he prefers to travel in a pack, which has lead to numerous traffic citations. However, he is good with children and has had all his shots.